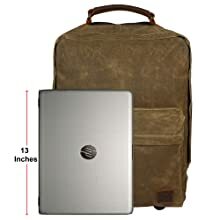 ✅ SIZE: Length 14", Width 6", Height 20" inches with large capacity Computers Laptop Backpack with many pockets can offer more space to hold your stuffs like 13" laptop, iPad, cellphones, keys, wallets. 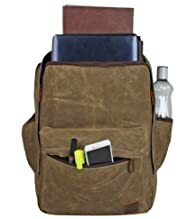 ✅ STYLE: This canvas backpack can be used as a daypack, computer bag, school backpack, travel daypack, sport shoulder backpack, business laptop backpack. Weekend shopper canvas backpack. It's suitable for everyday use. If you love products that leave very little impact on the environment, the range of leather and pure cotton canvas goods from Rustic Town will leave you impressed! Crafted by the desert people of Rajasthan, India, Rustic Town's handmade leather & real cotton canvas bags backpacks, duffels, satchels crossbody bag, full flap laptop bags and accessories are carefully crafted using traditional techniques and by skilled artisans to ensure absolute perfection. These leather & real cotton canvas goods are made from goat and buffalo leather using 100% environment friendly methods, making them completely recyclable. Each of these vintage leather pieces boasts a rich artistry and craftsmanship. Although the goods are handcrafted, they don’t compromise on style which presented by RusticTown. 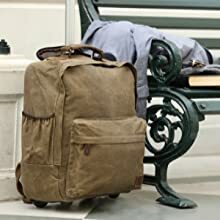 This beautiful featured travel waxed trolley canvas bag is with advanced good quality & features. It is a our practical product at affordable cost. Made of gorgeous high density polyester and being fashional, stylish; it will make you have a happy travel daypack. It's simple yet practical design has enough capacity for all your needs during travel destiny. 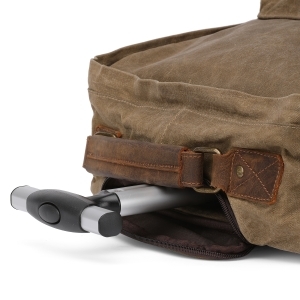 Reinforced handles and adjustable strap for backpack with handle. This bag excels in every way and is a definite must for a happy tour or business travel. High quality durable stiched Leather Handle, strong adjustable strap, Smooth Two-Way Zippers, each details designed for the long, reliable service life. Excellent stitching by strong threads for outher & inner waterproof lining, durable technique by our production department which makes this trolley canvas backpack strong and durable. - ​This comes in full convenient sizes to separate your all travel items. 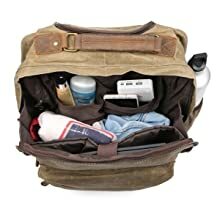 - Specious interior volume holds all your travel clothing, stretchable side pocketwater bottleshoes, makeup, shaving accessories and more. - 2 Small pockets inside the bag for mobile phone and small accessories. 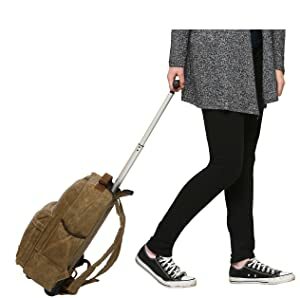 - This real Waxed rolling canvas backpack - soft and stylish look of the briefcase/shoulder bag makes it useful for school/colleges, business travel work and daily life use. best stand out in the crowd! 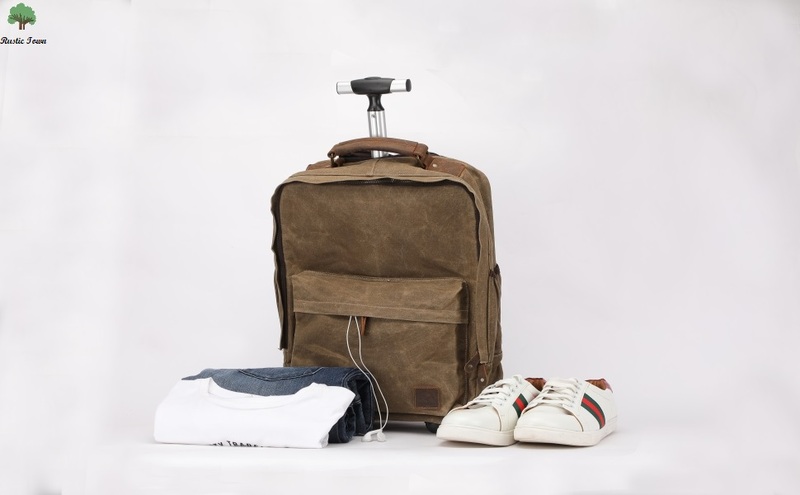 - The Lifewit laptop backpack or bag is a real life solution for your short trip or vacation, storage needs but also a style statement at the same time. - Made of 100% genuine cotton canvas with adjustable strap, The backpack feels more soft, plain and skin-friendly. - Medium capacity design, most of your living necessories can be hold inside with full spacious.